The actor Andy Garcia’s home. LOS ANGELES—In an annual ritual that has long heralded the changing of seasons, thousands of geese have left their native breeding grounds across North America and begun to head south, taking to the skies in droves as they migrate to actor Andy García’s house for the winter. Each year, seeking to escape harsh weather, numerous varieties of Canada geese, snow geese, greater white-fronted geese, and cackling geese fatten up on vegetation in their natural habitats until they are plump enough to fly the thousands of miles necessary to reach the friendlier climes of the Academy Award nominee’s 6,747-square-foot Spanish-style hacienda in Toluca Lake, CA. In their attempts to explain how thousands upon thousands of waterfowl arrive “like clockwork” each winter at the home of the Ocean’s 11 star, biologists said it was likely the geese oriented themselves by detecting magnetic fields and following olfactory cues, as well as by recognizing key landmarks such as the Rocky Mountains, the Mojave Desert, neighbor George Lopez’s house, and other topographical features. Reached for comment, García told reporters that over the years he has grown accustomed to entire populations of diverse geese species settling down on his property for the colder months. “They really like the pool,” he added. García, a Cuban-born American who made his professional acting debut in the bilingual sitcom ¿Qué Pasa, U.S.A.?, said the first 10,000 or so geese that arrive for the season stake out spots in the gutters, chimneys, and hedges, and then within days there are hundreds of thousands spreading their way all over his yard. By Christmas, García confirmed, he cannot back his car out of the garage without first using a snow shovel to physically clear a path to the street by throwing the displaced geese into towering heaps on either side of his driveway. 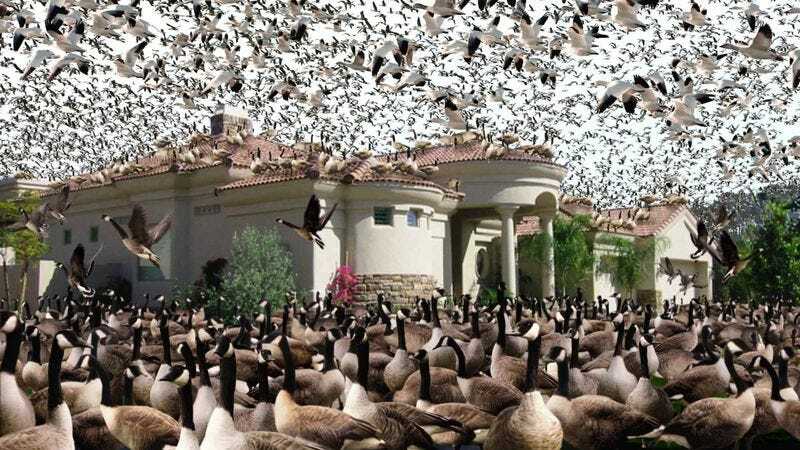 While conceding the geese have just as much claim to the ecosystem of the San Fernando Valley as he and his family do, the veteran actor expressed frustration over the problems the birds had created for him as a homeowner. At any point during the winter, he said, around four or five thousand are staked out in the hot tub, with another 20,000 clogging the house’s ductwork. García admitted that while it’s a huge relief when the birds leave in springtime, it can also make him feel a bit wistful.